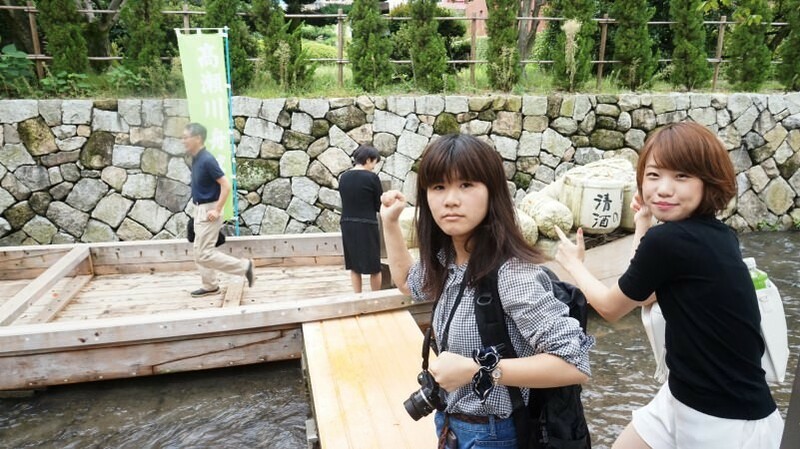 Sharing Kyoto's writers went to Takase River Boat Festival to see if it's really so much fun as we had heard! 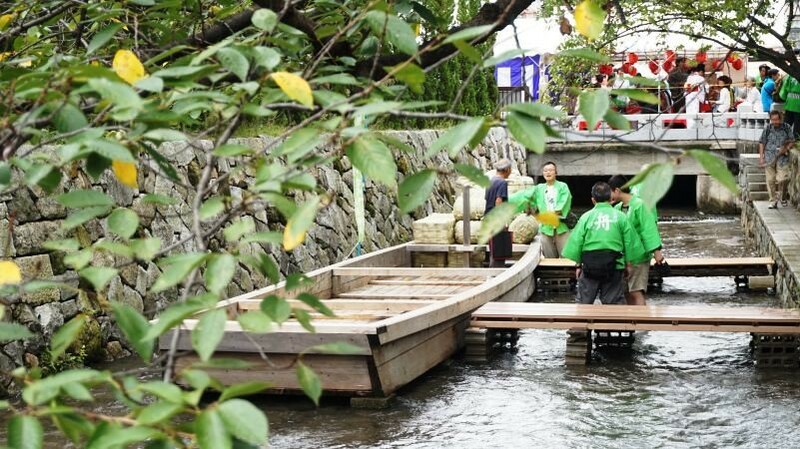 The Takase-gawa Fune-Matsuri (Takase River Boat Festival) takes place every year on the Autumn Equinox. 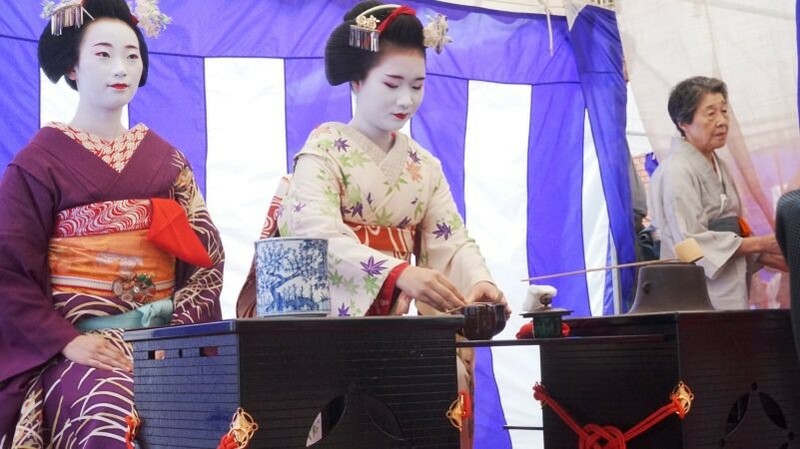 The area around the river features a range of events including tea ceremony demonstrations by maiko, traditional rakugo storytelling performances and a quiz walk. The festival’s been held since 1991 to help promote the area to a wider audience. 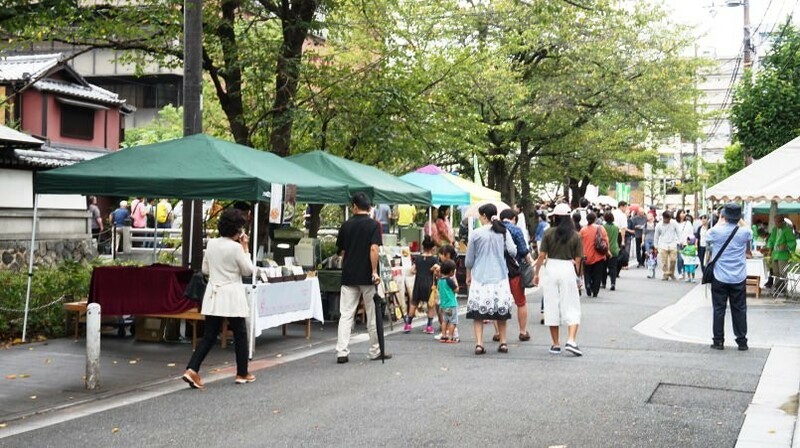 As well as the tea ceremony and other events, the festival attracts both younger and older visitors with a range of stalls selling food and souvenirs, a historical archive and other attractions. 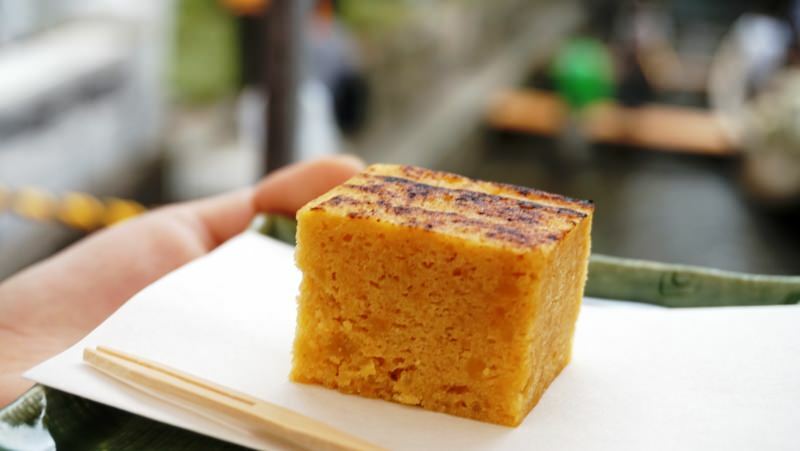 The festival venue is near dining and shopping areas such as Kiyamachi and Shin-Kyogoku Dori, so it’s ideally placed if you’re having lunch or shopping nearby. 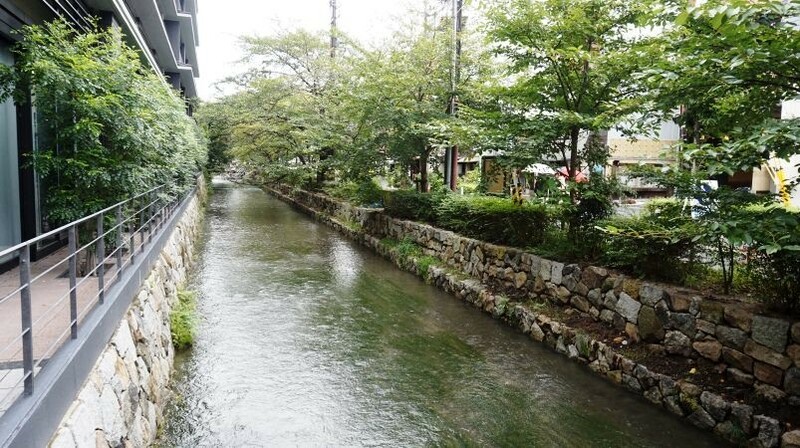 The festival venue is five minutes’ walk from Kyoto City Office. We’ve arrived! The event draws crowds from early in the day. Seems to be a big variety of stalls out too. Go on a bit further and the first of the boats comes into view. 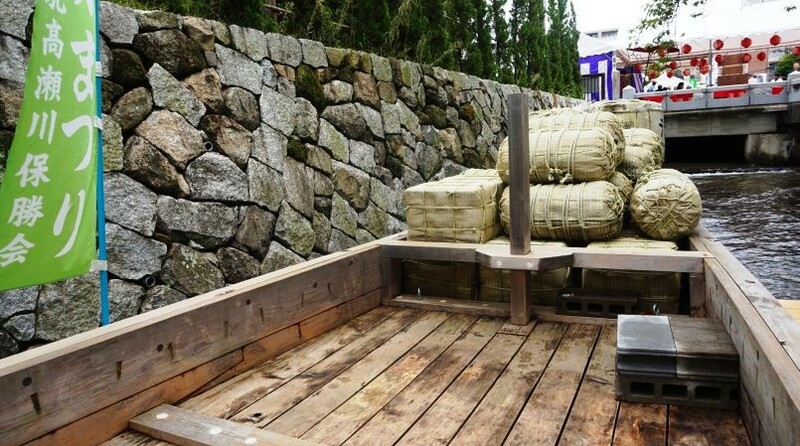 They’re called Takasebune, and until about 100 years ago they were used for transporting goods along the river. 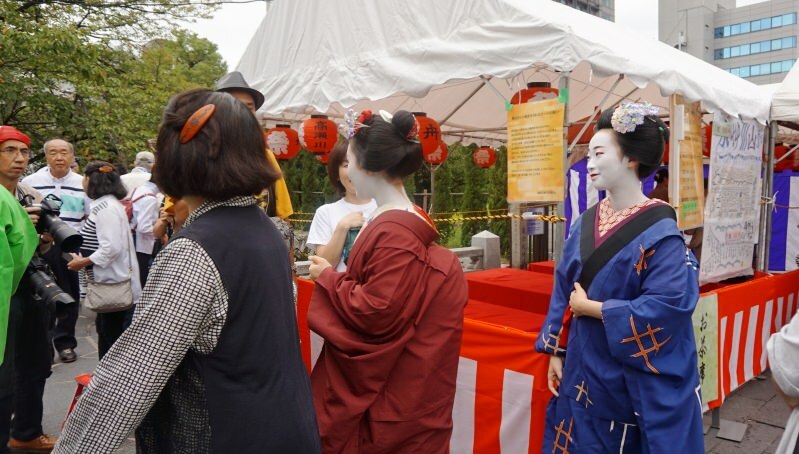 Many visitors come to the festival to see the maiko from nearby Ponto-cho demonstrate the tea ceremony or to take photos of them on board the Takasebune. 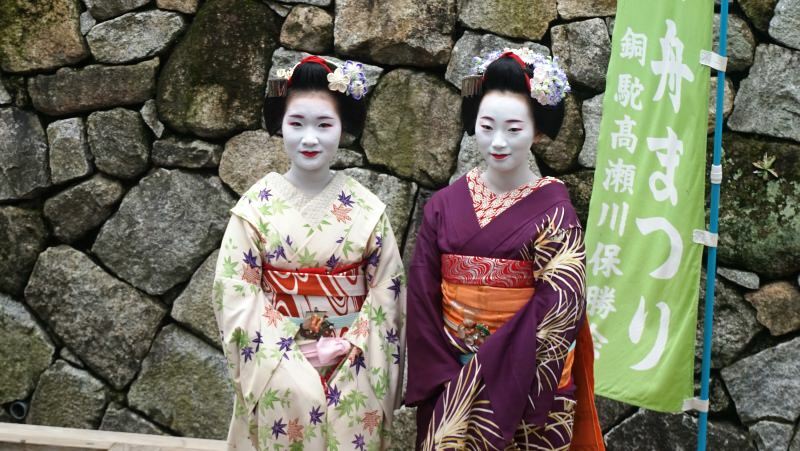 We thought hey, we must get some maiko photos too! But by then it was already too late...tons of people had been queueing up since early on, so we had to give up. 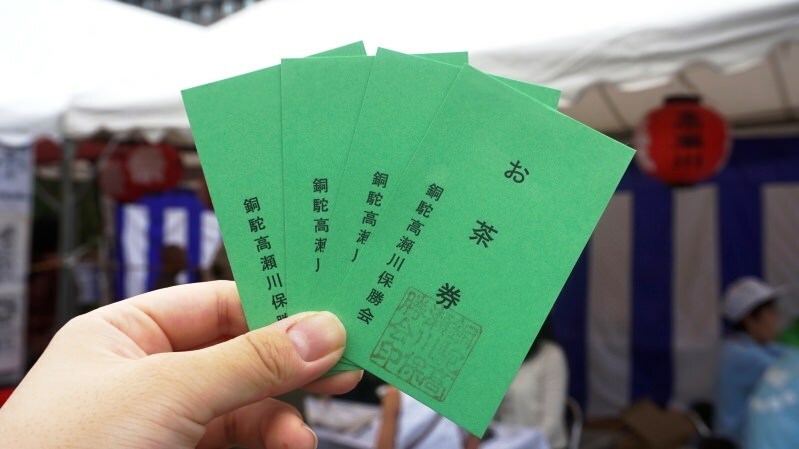 Luckily, we found that the tea ceremony and photo-ops were also happening later on, so we decided to get tickets for those at the nearby kiosk. We decided we’d join the 14:00 tea ceremony. Before that, time to take in the rest of the festival! Huge raw ham! No way we could resist eating something this impressive. We opted for the ham baguette sandwich. 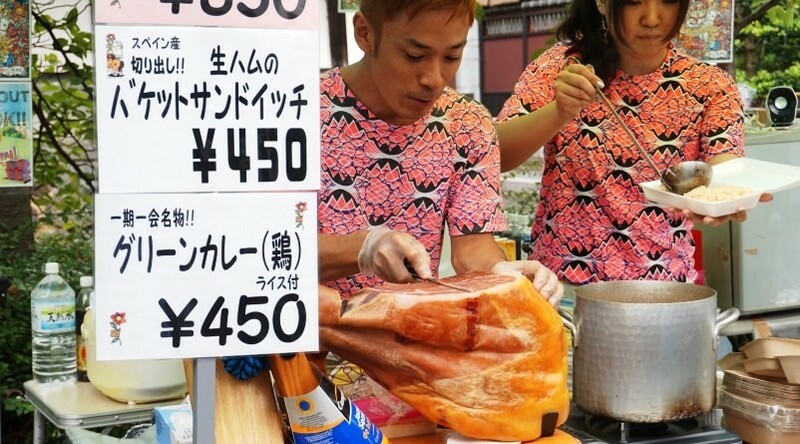 The ham comes freshly sliced right in front of you. Stomachs full, we continued our stroll and found a handmade bamboo-leaf boat stall. 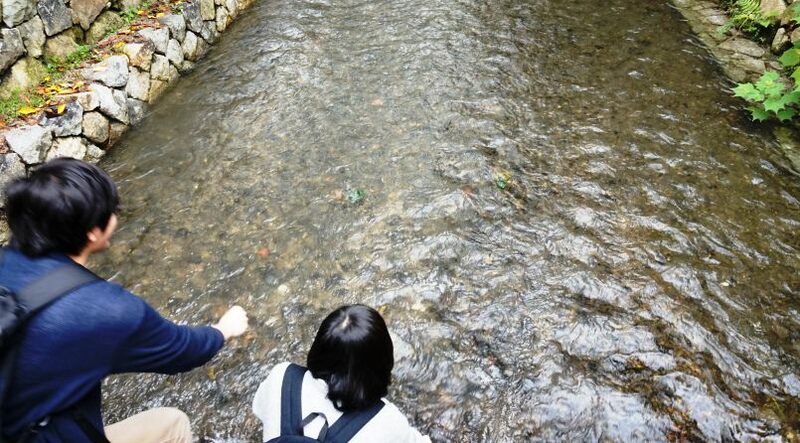 The stall allows you to make your own bamboo-leaf boat and float it down the Takase River. The Sharing Kyoto team got right to it. 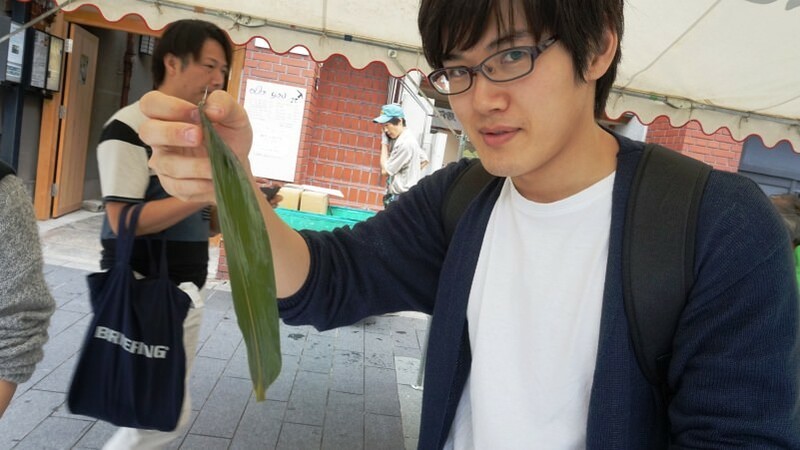 In his first appearance on the Editor’s Blog, here’s Takuya raring to go with bamboo leaf in hand! Finished! 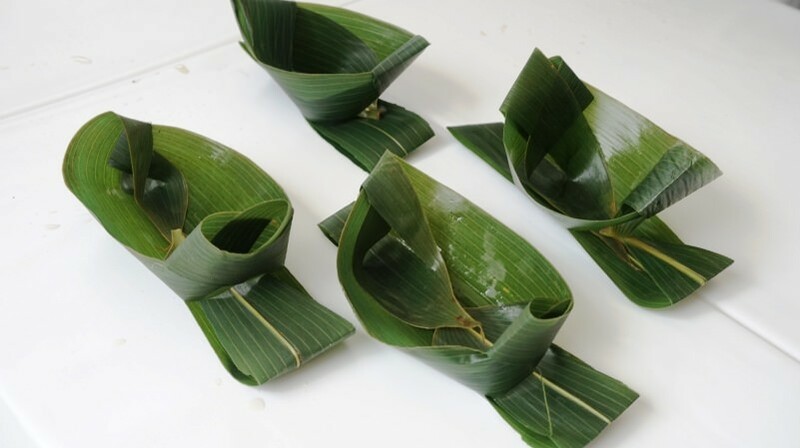 These look really simple to make, but doing it yourself is actually pretty difficult. Feel free to laugh at the totally different lengths and sizes the four of us managed. 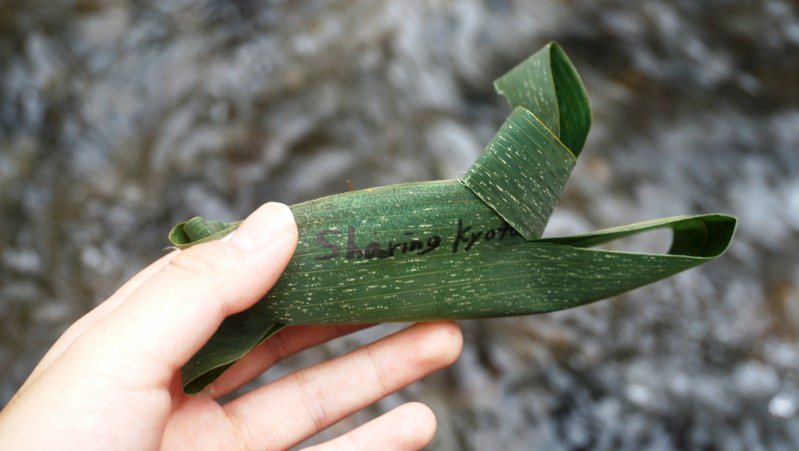 You’re allowed to write a wish on your boat, which we’re told floats down the Takase River and are is then collected as an offering for Yasaka Shrine. 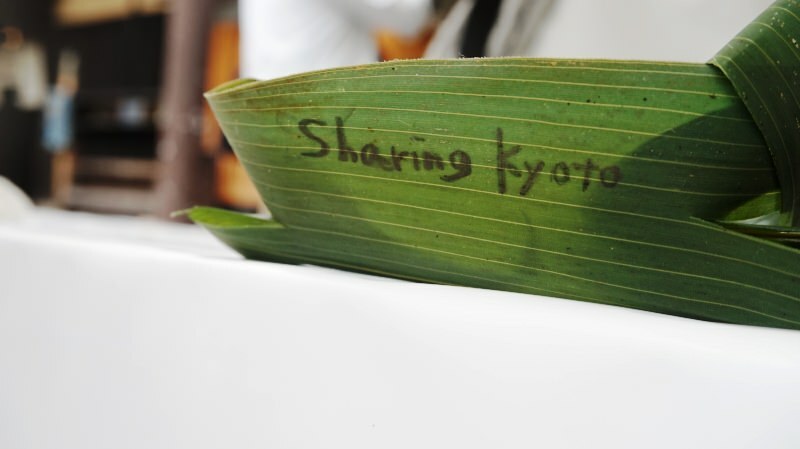 We sent off our boats with our wishes for Sharing Kyoto’s continued growth. Time to send them on their way! 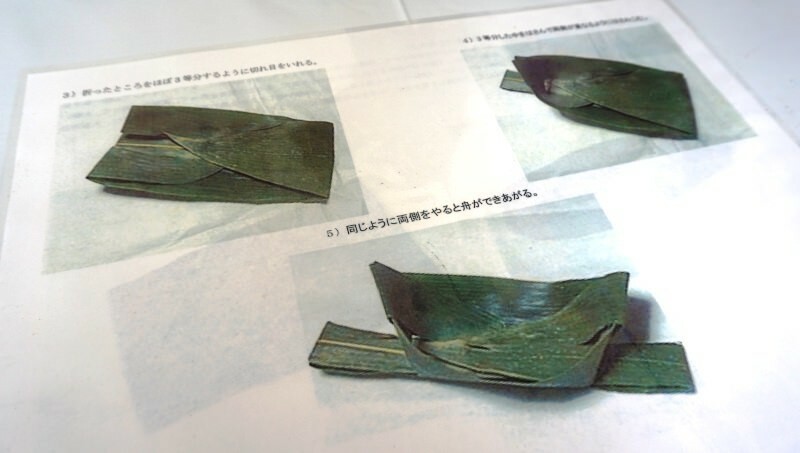 The Takase’s a fast river and the current turned our boats back into bamboo leaves in no time at all...fingers crossed they made it to Yasaka Shrine. The Sharing Kyoto also made a safe departure. 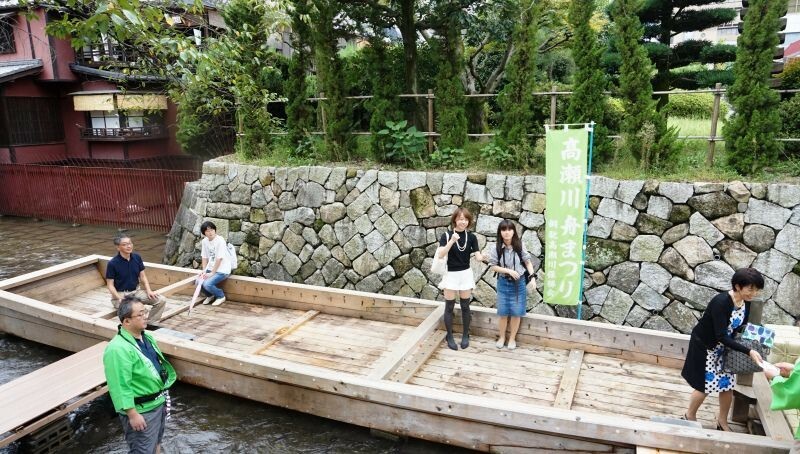 After we’d sent our boats on their way, we decided to board one of the Takasebune ourselves! It’s free and open to anyone. The boats are surprisingly big! The event staff in the green outfits are happy to take photos for you if you ask. We still had some time until the tea ceremony so we decided to stroll about a bit more. The Shimadzu Foundation Memorial Hall at the edge of the festival site is free to enter on the day of the festival. Shimadzu is a Japanese firm that’s well known for manufacturing high-precision equipment. 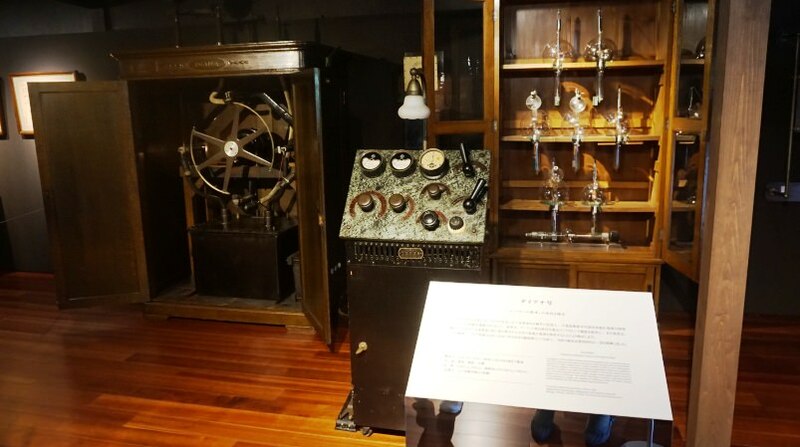 Inside the hall many of Shimadzu’s inventions are on display. 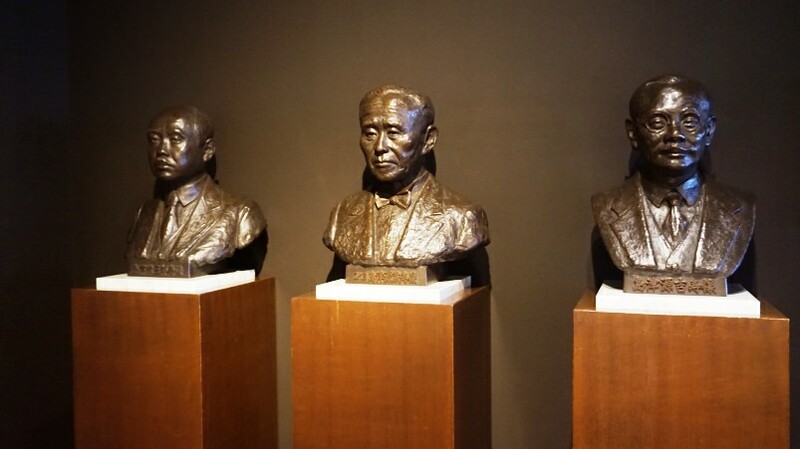 Bronze busts of the firm’s presidents. Apparently these three were brothers. 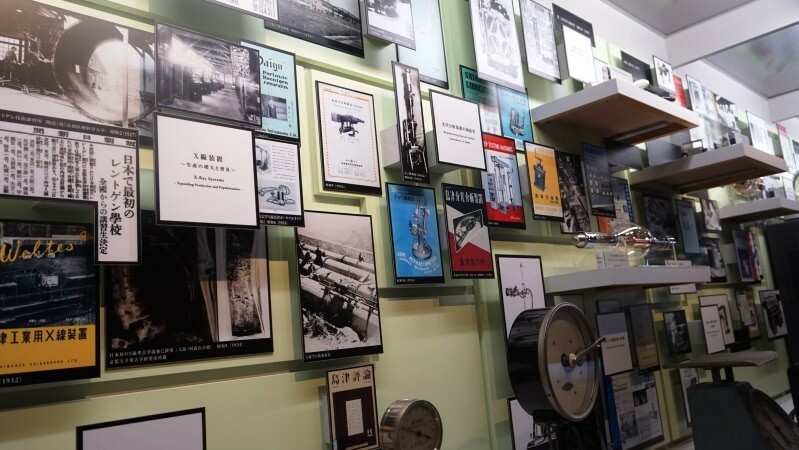 Another room displays the company’s history since its founding. Fans of retro design, history and inventions should enjoy whiling away some time here. Once we left the memorial hall it was almost time for the tea ceremony. The earlier you line up the nearer the front you get to sit, so get there early if you want to see the maiko up close! We got our fix of old-style Japanese atmosphere from watching real maiko prepare tea right in front of us. Drinking matcha tea prepared by the maiko with seasonal Japanese sweets. The sweets had a texture like a solid sponge cake and were really delicious. Next we headed off for a chance to photograph the maiko. 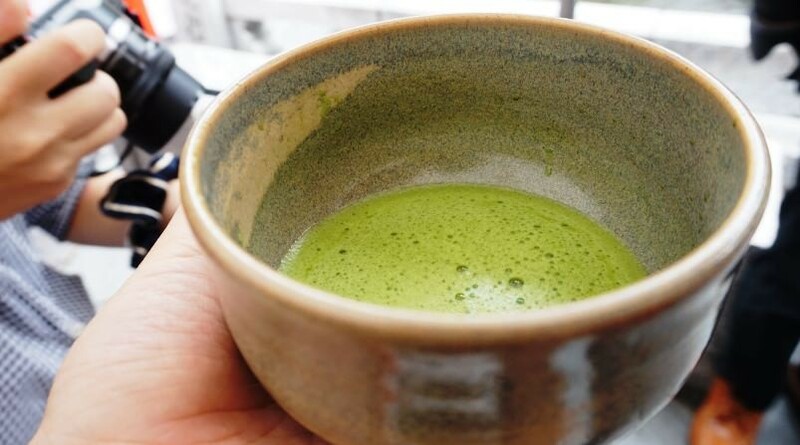 If you wait until the tea ceremony is over before setting off there’s a chance you won’t be able to get near them due to the crowds, so ideally you need to slip out early and secure a spot. We managed to get some great shots of the maiko! 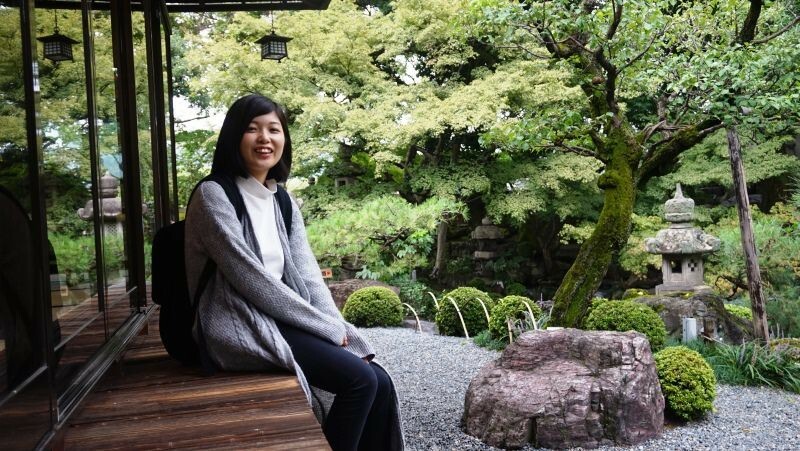 Finally, we went to take a look at the Japanese gardens at Ganko Takasegawa Nijoen (https://sharing-kyoto.com/eat_Ganko-Takasegawa-Nijoen/), which are free to enter on the day of the festival. Usually you can only enter these gardens if you are eating at their restaurant, but today we were able to get in free. 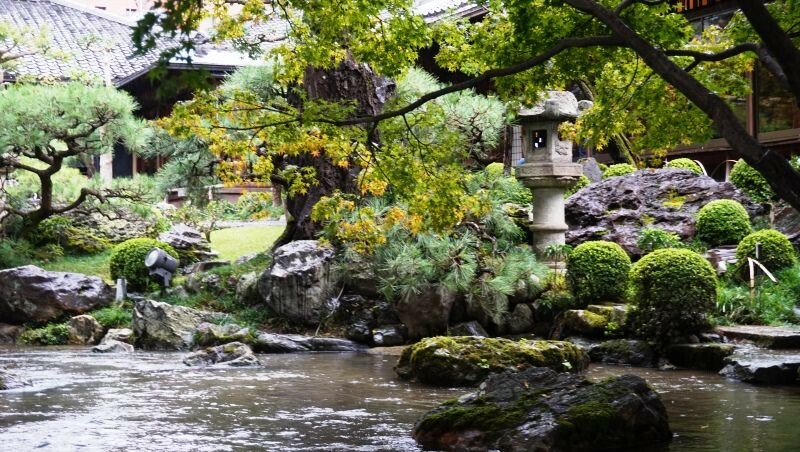 We’d recommend a look at this authentic Japanese garden. Shoko, who joined us at the festival today, also looks like she had a good time. Many people from the local community gather at the Takase-gawa Fune-Matsuri, and it’s also popular with overseas visitors who come to see the maiko. There’s a wide variety of events and the lineup changes from year to year; next year, why not drop by for a look around? This was a really fun-packed event! Apart from being able to board the boats, there are plenty of stalls around the area, and live performance and singing by Kyoto locals. There are also attractions for kids like bamboo boat-making and a treasure hunt, so there’s plenty of fun for families too. I think this is a festival anyone can enjoy, whether you’re going with friends, a date or your family.